Mt. Kenya is located in Kenya's central highlands a couple of hundred kilometers north of the equator. It is here, where the Kikuyu god ngai resides. 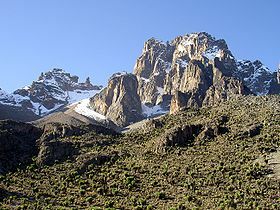 It is the highest mountain in Kenya and the second highest in Africa. It is one of the few places near the equator on Africa with permanent glaciers. The name of the country has been known to have been derived from Mt.Kenya which was formerly known as Mount Kirinyaga. Use the dropdown menu above to explore the various routes to the summit.